Following only the Mona Lisa, Vincent Van Gogh’s Starry Night may be the most famous image in Western Art. Where Mona Lisa is a portrait, Starry Night is a nocturne. “Nocturne” is the term used to describe paintings depicting night scenes. As with the night itself, nocturnes often evoke a moodier, spookier, sexier, more ominous or anxious feeling than their sunlit counterparts. The New Mexico Museum of Art in Santa Fe has devoted a show to nocturnes capturing all of these emotions and more. 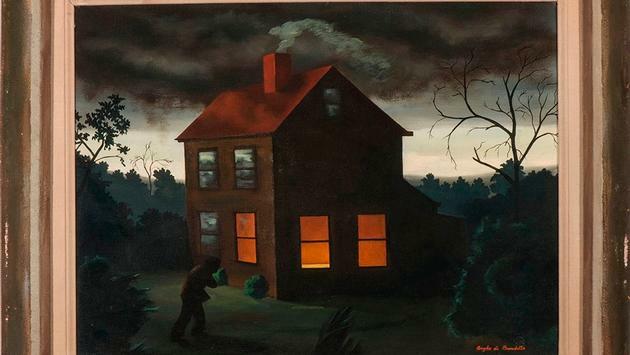 Wait Until Dark, on view through April 21, consists of almost 50 nocturnes pulled from the museum’s permanent collection. Ceremonial Native American dances, phantoms, a spooky old house, bats, trains and even a Ku Klux Klan rally are all pictured among the spine-tingling works on display. Examples from German-born painter and printmaker Gustav Bauman stand out. Bauman remains a giant of the Santa Fe arts community where he lived and worked for more than 50 years until his death in 1971. His prints depicting the local area remain iconic today. We’ve all shared the frustrating travel experience of our destination’s top attractions closing at 5:00, leaving us searching for things to do until, or after, dinner. While Santa Fe is a must-visit for art lovers, most of its museums and galleries likewise close at 5:00. Here are occasions when they don’t, and great opportunities to enjoy art after dark. The New Mexico Museum of Art stays open until 7:00 PM on the first Friday of every month November through April and on most Fridays the remainder of the year. Likewise, the Georgia O’Keeffe Museum, located less than a five-minute walk away, stays open until 7:00 on Friday nights. May through October, participating galleries along Santa Fe’s world-renowned Canyon Road arts haven stay open until 7:00 PM on the first Friday of the month. Canyon Road’s galleries are also continually hosting opening night exhibits featuring artist meet-and-greets which are free to the public with extended evening hours. For contemporary art, the nine outstanding contemporary art galleries in Santa Fe’s Railyard District host their own art walk until 7:00 PM the final Friday of each month year round. Immersive. Kaleidoscopic. Zany. Each of these words applies to the funhouse meets art installation known as Meow Wolf. What started as a quirky local artist collective in 2008 has grown into a 20,000-square-foot attraction welcoming tens of thousands of visitors who crawl, laugh and travel through the building in amazement every year. Meow Wolf is open until 8:00 PM Sunday, Monday, Wednesday and Thursday and until 10:00 PM Friday and Saturday. Are you interested in traveling here for work or vacation? Travel agents have access to huge savings you’d never find booking on your own. Enter your email below and one of our expert travel agents will be happy to help you save money! If you can’t make it to Santa Fe for Meow Wolf, the brand and concept are expanding with openings in Las Vegas later in 2019, Denver in 2020 and Washington, D.C. beyond that. Santa Fe calls itself “The City Different” and New Mexico “The Land of Enchantment,” both of which can be experienced by visitors after the dark.